Emile Erckmann (1822–99) and Louis Alexandre Chatrian (1826–90) began their writing partnership in the 1840s, and continued working together—producing plays, novels, and short stories—until the year before Chatrian’s death. At the height of their powers they were known as ‘the twins’, and their works proved popular in England, where they began appearing (in translation) as early as 1865. After their deaths, however, they slipped into obscurity; and apart from the odd tale reprinted in anthologies, and the ill-fated collection of their weird tales published by Millington in 1981, their work has remained difficult to find. In The Invisible Eye, Hugh Lamb has collected together the finest weird tales by Erckmann–Chatrian, adding several stories to those which he assembled for the Millington volume (the fate of which he discusses in the appendix to the present work). 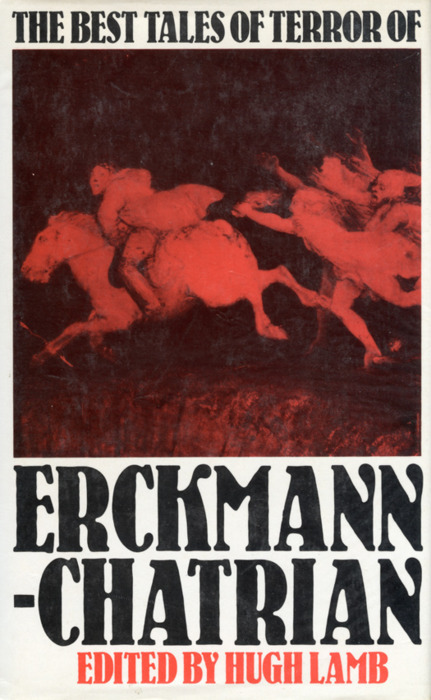 The world of which Erckmann–Chatrian wrote has long since vanished; a world of noblemen and peasants, enchanted castles and mysterious woods, haunted by witches, monsters, curses, and spells. It is a world brought to life by the vivid imaginations of the authors, and presented here for the enjoyment of modern readers who wish to be transported to the middle of the nineteenth century: a time when, it seems, anything could happen—and sometimes did. —Publisher’s description for Hugh Lamb’s anthology The Invisible Eye, an expanded edition of the “ill-fated” Best Tales of Terror of Erckmann-Chatrian (pictured here). Best Tales includes these 10 stories: The Crab Spider, The Murderer’s Violin, The Invisible Eye, The Child Stealer, My Inheritance, The Mysterious Sketch, The Owl’s Ear, The Three Souls, The Wild Huntsman, The Man Wolf.